If you know me, you know I love my sweets. I don’t think I could ever give up having something a little sweet every day. The way I used to satisfy my sweet cravings before I stopped eating conventional processed junk food vs. now, is like night and day. Back then, I would eat anything sweet, including those treats full of artificial ingredients and a ton of refined sugar with lots of high fructose corn syrup. Now, I go for the most real organic ingredients available that have a nice dose of nutrition but can be sweetened to create a dessert. This simple, fast, and easy to make recipe does just that! Most desserts out there are empty calories that keep you wanting more, but this dessert is different. This recipe includes a nice dose of healthy fats that satisfy you quickly so you don’t overeat. 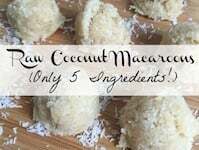 After a few of these raw coconut macaroons, my sweet tooth is tamed and I’m one happy girl! I used to buy similar raw macaroons at my local organic restaurant and at Whole Foods, but now that I make these in big batches and freeze them, I’ve always got some handy. I am definitely saving money too which is a great bonus. To make chocolate macaroons, add 1 tablespoon cacao powder. If you don’t have a food processor, you can try using a blender or a hand blender – I’ve used both and they still work well. If you really want to go crazy, dip these in some melted chocolate after following this recipe and refrigerate them again. I’ve done this a few times with organic dark chocolate with a few drops of peppermint extract – and they become out of this world good!